After a most regrettable absence of several months, the time has come at long last to resume our long-running series taking a hexagram-by-hexagram look at the I Ching. As a fallible wizard, I struggle with change. On the one hand, I want everything to stay the same. For example, I’m still pissed off every time I pass what used to be the Hub Bowling Center and one of my favorite places. You might charitably be inclined to call that normal – but the place closed in like 1999. And that’s just one small example. On the other hand, I am generally so dissatisfied with the current order of both broader society and the struggles I face as an individual that I find myself demanding that everything change. Immediately. I don’t leave a lot of room for middle ground on this one. I’m looking for things to remain static or erupt into universal chaotic flux all at once. Of course, that’s not the way the universe works. The I Ching, compiled in China several thousand years ago and attributed to no single author, is premised on the fundamental tenet that everything is constantly in a state of change – and that this change can be classified, understood, and mastered. The book is divided into 64 hexagrams, six-line symbols comprised of some combination of solid and broken lines, 64 being the total possible combinations of this framed binary. Put most simply, these are the 64 possible states that exist in the universe, and understanding what they mean, what they lead to, and what course of action they indicate can – at least ostensibly – guide us into a greater understanding of what is going on around us and what it all might mean. We make this return with the 34th such hexagram, a discussion on possessing power and all its inherent pros and cons. Late March into April is a wonderful time, isn’t it? At least, it certainly seems so at the moment as yet another mid-week winter storm heads our way, after we’ve barely had time to recover from the two-part January cold snap that gripped much of the nation in near- or below-zero temperatures. 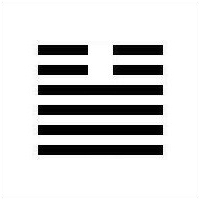 Well, indulge in a trip of the imagination for a moment – that’s the time of year this hexagram describes. This is the moment at which strength converges together with movement, a combination that results in us having some pretty serious power. In this instance, this is in no small part the result of the worth we’ve been carrying within us all through the long dark winter, worth that is now finally freed and able to be translated into ability. We’re reminded of the familiar image of thunder bursting forth from the earth to clear away the latent tension in the air. Here, the time is spring, and the air is ripe for clearing. Heaven itself, we are told, is on board with this. Keep ourselves in the right relationship with the world and the cosmos, and it’s all ours for the taking. Good times. Yet, as we may have come to expect from this text, it’s not long before our celebrations are tempered with warnings. After all, even in the possession of power, if we are to let our actions degenerate into little more than mere force, we may well have gone all the way through this winter for nothing. We’ll blow our power, waste our strength and freedom of movement, tossing it all away in a frenzied haste. No, as with everything, we need to consider justice. We need to consider the content of our own behavior, whether it is what’s best or not. Specific timing is also going to matter a great deal. Don’t hurry, don’t dally. This is all pretty familiar and consistent I Ching advice. If we follow it, the promise goes, we can really maximize the power we’ve been granted, really use it to ascend in a lasting way. More specific details – as is standard – are contained in the commentary on the six lines individually. When power is obtained while we still exist in a lowly position, which may not be unreasonable to expect, we’ve got to be extra guarded against tending toward brute force. We’ve got less at our disposal and we’re more likely to resort to this path – and we’ll fail if we do. If, on the other hand, we avoid falling into such traps, when we see the gates of success opening before us, that’s just the time when it’s most important to maintain our inner centeredness. Even when victory looks certain, we can still screw the whole thing up by going overboard. We’ve got to contain ourselves. That’s a major key, here – taking our power and jubilation too far is easily the greatest danger we face. There’s really no imagining how complicated it will get if we devolve into any sort of overzealousness at any step along the way. The flip side of this, however, is that we always retain the ability to right the tipping boat by realizing this and behaving accordingly. This can even take the form of something seemingly minor as bragging about our power. I don’t even need to explain all the complications that kind of behavior will result in. Keep cool! If you continue on quietly as your power pays dividends, if you keep a low profile and avoid attracting attention, you can use this time to do almost anything. You’ll find a point, eventually, where you don’t even have to think about being aggressive anymore. It’s just not necessary. Victory is ours. Gives us something to look forward to now, doesn’t it? Previous Post Know that Moment Right Before Things Begin? This will blow your mind.